De Caro & Kaplen, LLP, have processed over 2,000 applications since the initiative’s launch in January. 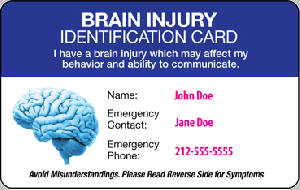 PLEASANTVILLE, NEW YORK, USA, May 1, 2018 /EINPresswire.com/ -- Over 2,000 brain injury survivors across America now carry a personalized brain injury identification card. 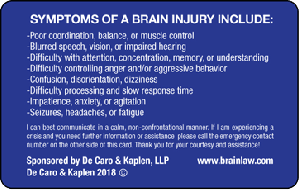 The card, which includes the individual's name, a designated emergency contact, and common symptoms of a traumatic brain injury (TBI), was launched in January by New York brain injury lawyers De Caro & Kaplen, LLP. But while the firm has been pleased with the public’s initial response, they stressed that they are barely scratching the surface. Michael V. Kaplen reiterated the benefits of the card, and why the partners chose to introduce it, “Brain injuries can cause confusion, inappropriate behavior, and perplexing responses by brain injury survivors, including slurred speech, or an unsteady gait. We have seen several instances where police have confused these symptoms with resistance to police inquiries, criminal conduct, or being under the influence of drugs or alcohol. Unfortunately, these misunderstandings have resulted in inappropriate arrests." Application for a complimentary personalized card can be made on De Caro & Kaplen's website at https://brainlaw.com/brain-injuries/card/. The cards are provided free and will be shipped to any address in the USA.